What's include on Chartres Events March 2014 list and what could be the best thing to do? Just keep on reading! Big events this month should be the annual Chartres Harpsichord Festival which will be held on late of March, this year horse racing at Chartres Hippodrome will be start also in this month until December. 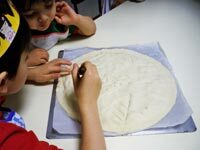 March 1 : Cooking class for adults - Eclair au Chocolat et café, cost: 23.90€/person. March 22 : Cooking class for adults - Cornes de Gazelle, cost: 23.90€/person. Hippodrome de Chartres is the most important one in the Centre region. The annual racing starts on March until end of the year. Kids can also have fun with some attractions like mini racing and bouncy castle. March 11: Comme S'il en Pleuvait - theater, Pierre Arditi, ticket price for adult: 32€, under 25: 23€, children: 15€. March 15: Au Temps Des Impressionnistes - classical French music, ticket price for adult: 12€, under 25: 7€, children: 5€. March 18: Le Porteur d'Histoire- theater, Alexis Michalik, ticket price for adult: 23€, under 25: 15€, children: 9€. March 29: Tout Offenbach, Ou Presque - musical show, by Alain Sachs, ticket price for adult: 23€, under 25: 15€, children: 9€. Salon du Chocolat and Chartres Flea Market takes place at the same time in Chartrexpo. Last year experience was you will need only one entry ticket for both events! It´s the annual Chartres Flea Market - With 4€ entry ticket (free for under 16) you can hunt for numbers of used objects and classic arts can be found in this market not to mention the precious things like books, lamps, furniture and many more. A perfect place for classic arts collectors. Happy hunting! 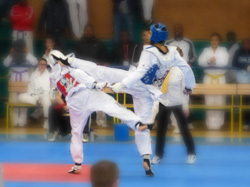 The second edition of Eure et Loir Open Taekwondo for all categories. The competition will be using electronic body protectors. Refreshments, souvenirs and equipments stands available on site.